Dr. Ra’anan Tobey is an assistant professor of physics in the Zernike Institute for Advanced Materials at the University of Groningen, Netherlands. As Rosen Scholar he will develop real-time imaging capability of nucleation dynamics in complex oxides and itinerant ferromagnets. 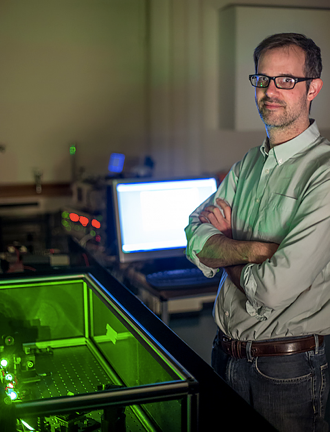 To achieve this goal, Dr. Tobey’s expertise in transient grating spectroscopy will be combined with Los Alamos National Laboratory’s expertise in coherent diffraction imaging. Dr. Tobey will use this technology to probe the dynamics of competing phases to gain further understanding of materials performance. The techniques and expertise developed with this work will impact the proposed Matter-Radiation Interactions in Extremes (MaRIE) facility. With demonstrated creativity in the development of techniques to capture ultrafast materials dynamics, Dr. Tobey is a pioneer in applying the ultrafast optical and x-ray technique known as transient grating to magnetic and electron processes. He has extensive leadership in using ultrafast optical, x-ray, and electron probes to study correlated electron and magnetic processes on the femtosecond and nanometer to atomic scales. His experience includes research on dynamics in magnetic and strongly correlated materials; ultrafast optics; time-resolved visible, terahertz, infrared, and soft x-ray spectroscopy; transient grating spectroscopy; ultrafast electron diffraction; synchrotron and free-electron laser science; cryogenics, and magnetic fields. Dr. Tobey, who earned his Phd in physics in 2005 from the University of Colorado, has led or participated in many seminal ultrafast spectroscopy and imaging experiments and has more than 35 high-impact papers in journals such as Science, Nature, Nature Photonics, Scientific Reports, and Physical Review Letters. Before joining the University of Groningen, he held postdoctoral positions at Brookhaven National Laboratory and the University of Oxford.